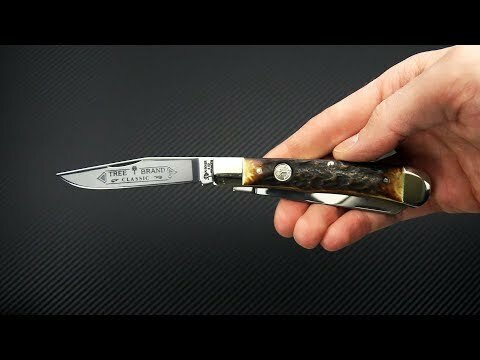 The Trapper is a classic folding knife pattern with an iconic two-blade combination and slip joint construction designed for a variety of uses. This high-quality interpretation from Boker knives of Germany employs a polished carbon steel blade with classic etch traditionally reserved for premium knives. The Trapper handle sports dual nickel sliver bolsters and and brass liners for a traditional slip joint construction. This version comes with Stag scales for a rugged and timeless feel, just what you want in a classic design. A winner for users and collectors alike. Blades: The Solingen Trapper sports two blades: a single, long clip point blade executed in polished carbon steel with a tradition nail nick and snappy, slip joint operation. The full flat grind makes this a very functional and utilitarian blade for users while collectors will be pleased with the visual appeal of the classic Tree Brand logo etch contrasted with the bright, polish finish. The second blade is a traditional Spey blade that has a more robust tip and plenty of cutting edge for heavier use. Handle: Dual, brushed nickel silver bolsters and Stag scales are mounted to brass liners with stainless steel pins offering a sleek yet tough and classic handle. This is a large and comfortable handle built for serious use while retaining a beautiful aesthetic. The front scale is embellished with the Boker Tree Brand Shield. A stainless steel back spring delivers smooth yet snappy operation on both of the blades.